Participants at the New Year's Convention for Okinawan tourism carried out a Japanese traditional ceremony kagami-biraki at the Pacific Hotel Okinawa in Naha on January 5. On January 5, the Okinawa Convention & Visitors Bureau (OCVB) held a New Year’s Convention for Okinawan tourism at the Pacific Hotel Okinawa in Naha. About 1,000 people related to the Okinawan tourism industry and the Okinawa Prefectural Government took part in the convention. 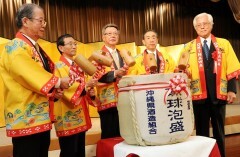 They prayed for the further development of Okinawan tourism. Music producer Eisho Higa, the vocalist of BEGIN, performed Okinawa tourism’s promotional song “Ichariba Yui,” which was created to warmly welcome foreign tourists visiting Okinawa. The event also introduced Miss Okinawa 2015.